LA Times, ABC Television affiliates, Yahoo! and Market Watch. Display of the image on the Reuters digital billboard in Times Square Images are displayed on the billboard during the morning or afternoon rush hours, Monday - Friday. The story headline is also displayed with the image (up to 100 characters) You receive a screen shot of your image on the billboard (what a powerful visual!) The Reuters sign is the world's largest digital sign. It is 23 stories tall and is comprised of 13 screens. It is a prime location, occupying the entire Southwest corner of Times Square, and it faces traffic! To see the sign via a live webcam, you can visit: Timessquarelive. An image can be anything - a logo, a headshot, a product-in-action shot. With your next press release, include a jpeg file (at least 200 dpi and 9 inches on the longest side) For this special, send us an email at pr@continentalwhoswho.com and request the Internet Photo Distribution. As the saying goes - a picture is worth a thousand words - but that's only if people see it! So, what are you waiting for? See your name in lights on a Times Square billboard. 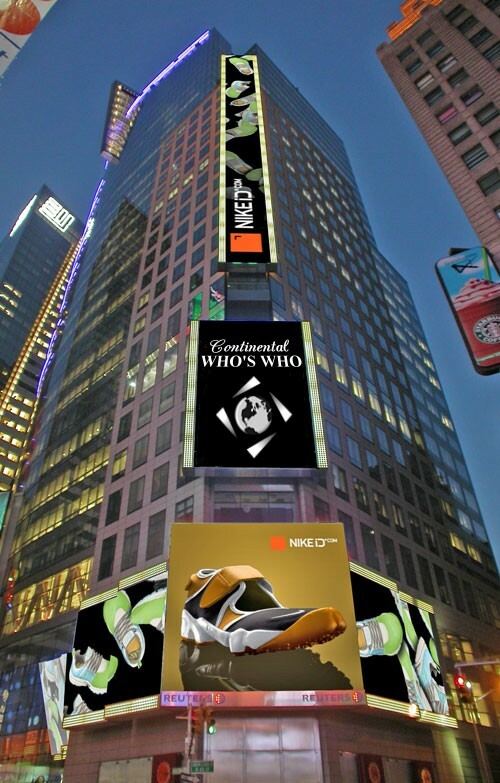 The Continental Who's Who Registry of National Business Leaders Hardcover Volume lists thousands of successful individuals in the fields of Business, the Arts and Sciences, Law, Engineering and Government throughout the upper echelon of corporate America with their pertinent data. This is an invaluable reference and networking tool, the ultimate in independent recognition. Provides expanded business information, unavailable elsewhere on all of our respected members. A new Member appearing in our publication can receive the coveted Continental Who's Who wall plaque, a rich and elegant exhibit inscribed with your name- which also incorporates the Continental Who's Who seal. This distinguished plaque is seen on the walls of the most influential individuals which convey to your existing and potential clients that you are someone with whom they want to do business with. 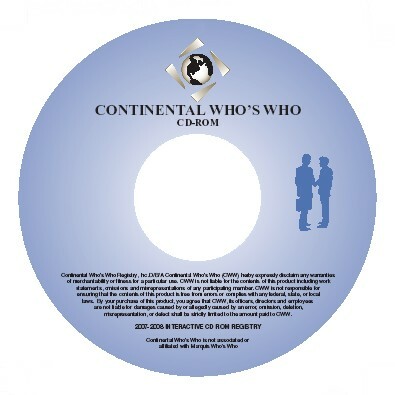 The Continental Who's Who CD-ROM Registry is a compilation of all its members along with their accomplished biographies, published in Cd-ROM format. The CD-ROM version of our publication is unique in the fact that you do not need Internet access to network with the directory. The CD-ROM was designed to be user-friendly, high speed and efficient. 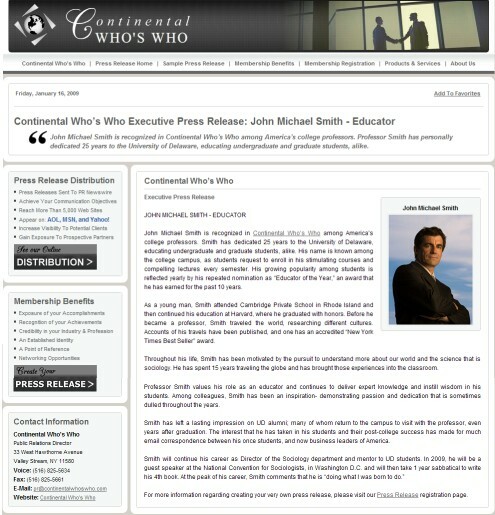 Continental WHO'S WHO puts you, in the loop by providing an introduction to other achievers in your area of expertise and then offering unique opportunities to interface globally, the ability to meet and network online. Each new member can receive a screen name and pass code to network online and upload photographs and video to their existing online profiles. 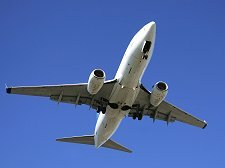 Who's Who Airfare on Us! Continental Who’s Who provides Airfare on Us. Round-trip airfare for two to some of the most exciting destinations dreamed, plus either attraction tickets or round of golf provided the accommodations are purchased through OST for a select number of nights. You may have received one of the most innovative vacation packages available today to learn more please visit www.onestoptravel.com then click on Who’s Who.